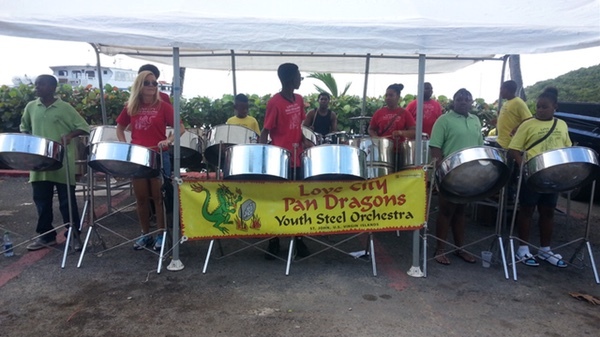 St. John’s small but beloved Love City Pan Dragons Steel Orchestra, our only steel band, is in imminent danger of being lost to the Virgin Islands fiscal crisis. We are reaching out with our story to try to forestall this calamity. 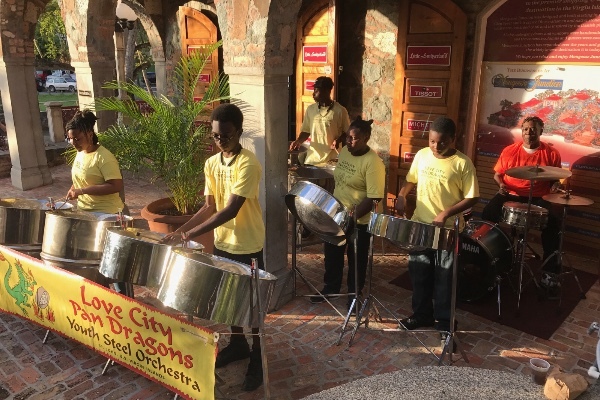 The Love City Pan Dragons Youth Steel Orchestra has been a year-round presence on the Virgin Islands cultural scene for nearly 30 years. Visitors and locals alike enjoy our music at St. John and St. Thomas carnival events, at holiday celebrations, and at fundraisers for our own and other community organizations. We provide ensembles for private engagements. We have performed in Tortola, Antigua and St Croix, and traveled to Trinidad to tour the birthplace of steel pan. For the last few years we have been able to cover the bulk of our modest operations budget with an annual grant from the Department of Sports, Parks and Recreation, who had funds earmarked for established independent youth programs that fit their mandate. This grant made it possible for us to keep our single paid staff – our professional instructor/arranger — coming from St. Thomas twice a week to guide our young players on the road to musicianship. Unfortunately the funds for our 2017 grant, although approved, have not been released due to the current fiscal crisis. Our other small annual grant from VI Council on the Arts, which covers about a month of expenses, may also be in jeopardy. We hear whispers that the National Endowment for the Arts, which provides funds toward VICA’s grants, is under threat from the new federal administration. This would be an incalculable loss to the progress of culture and the arts made since the Kennedy years, and a painful loss to Virgin Islands artists and organizations like ourselves. We have just enough left to keep our doors open through St. John’s Fourth of July parade. We have full non profit status under the federal IRS 501c3 code so any donations are tax deductible. Our long term goal is to raise the $15,000 previously funded by SP&R to cover operations for one year. Our short term goal is to raise $1,500 immediately to hire a pan tuner to enhance our instruments' sound for our Carnival performances. We do not want to close the doors, even temporarily, of this much loved little steel band after 30 years of continuous service to the youth and culture of our St John community. Thank you one and all for assisting in our Gofundme attempts in keeping the Love City Pan Dragons alive and bring music to the islands. As our arranger says, "Music is life!" We are so pleased that we have surpassed our short term goal and can now get the instruments tuned for their upcoming Carnival performance in St John. BUT we aren't done yet! We really want to make sure that music continues through the year with our steel drum orchestra. Thanks so much for your generosity but let's keep going!! Much love ! I've been fortunate enough to hear the Pan Dragons. I wish them all the best! We raised $325 at our last Full Moon Dinner and matched these donations for a total of $650. Long live the Pan Dragons! A wonderful organization. I wish you well. Love the Pan Dragons! And so appreciate all who teach the youth, keeping this aspect of Love City culture alive.